Easy Kicks, a Nike backed startup, is revolutionizing the business of kids shoes through an innovative subscription model that applies Circular Economy principles. For $20 per month, parents can order a variety of curated Nike and Converse kids sneakers on demand and swap them out whenever a new pair is needed. Once the new shoes arrive, customers place their kid’s old pair in a supplied, prepaid, envelope to send them back. Once Easy Kicks receives the old shoes they inspect them to see if they are in good enough condition to be used by kids in need. If the shoes are totally worn out, the shoe is recycled via Nike Grind to be used as court and playground material. Their goals is to ensure that no shoe goes to landfill. Easy Kicks delivers an amazing customer experience and is a great example of how Human Centered Design can be applied to solve a real need for its customer, parents, and it’s users, kids. Kids grow out of things quickly and it can be a real pain point for parents. Easy Kicks’ subscription model, automatic shipping and curated selections make getting great fitting shoes as seamless as possible for parents. What’s more, they have taken the guesswork out of determining foot size by placing a measuring chart on the packaging with every order. This is not only convenient for parents but also reduces extra shipping costs associated with fitting errors. 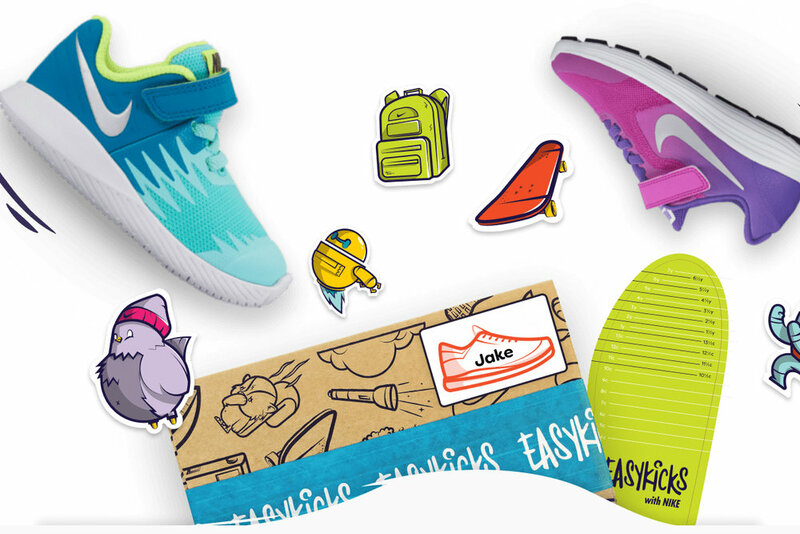 Additionally, Easy Kicks provides an extra personal touch by placing the kid’s name right on the box and supplying them with kid-friendly, high quality, illustrated stickers. This is a smart play for Nike as it is likely that such a great experience will yield a lifelong customer. Enough about design, let's talk business. Easy Kicks demonstrates that Circular Economy ideas can increase profits. For example, kids ages 1 to 3 should have their shoes replaced every 3 ½ to 4 months while ages of 4 to 6 should have their shoes replaced every 4 ½ to 5 months. With an average retail price of $48, Easy Kicks breaks even after just 2 months at their $20 per month rate. If a parent replaces their kids shoes every 4 months, and Easy Kicks receives the shoe at a wholesale price of $25, then they stand to make $55 in gross margin. This is more than double what they would make in a traditional retail channel. Sure, there will be some parents who will order shoes at a higher frequency but those people tend to be the outliers. Nike’s commitment to taking responsibility for the product at the end of its use is admirable and where Easy Kicks shows its Circular principles best. Their social and environmental stewardship creates a compelling brand for customers to get behind and helps to reduce unnecessary waste. Easy Kicks is a leader in both design and the Circular Economy space. They are proving that such a model is profitable for both brands and retailers alike. I think it’s time for Nike to create more products that feature Nike Grind. Nike claims that their grind materials are used in 71% of their footwear and apparel, but I am skeptical about how much of a given product contains recycled material. A compelling product story would be one that completes the circle and highlights the use of recycled material more prominently–or example, as a midsole made from Nike Grind. This would allow the customer to tangibly see the recycled material and create a visual and tactile experience that speaks to their desire to do good. At first, this could be done from post-industrial waste or in combination with post-consumer waste so as to retain similar qualities as new materials would. Besides Nike adjusting their product, Easy Kicks has done a great job of rethinking ownership, reducing unnecessary waste, and designing a great experience. Thanks to Sky Gilbar from Up Up and Away for sharing this company with me.